Light emitting diodes surround the image sensor. The camera is used as a projector while composing the shot. Just prior to taking the shot, the diodes turn off and the camera’s shutter closes before opening again for the normal picture-taking sequence. Cameras without viewfinders benefit from the Framing Light. 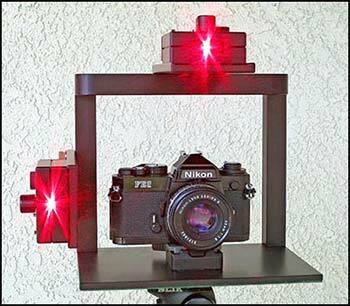 Version 2: The frame line can be projected from a grid of diodes beside the taking lens, simplifying the camera design by using a standard image sensor. Various aspect ratios can be projected, and parallax errors are eliminated by using the camera’s focus distance to shift the pattern of lighted diodes. The projected frame automatically adjusts size when zooming the taking lens. Version 3: Framing lights can be integrated into the rim of lenses to project the horizontal and vertical fields of view. The projected spread angle adjusts when the lens is zoomed. To eliminate any parallax error, the framing light for the horizontal FOV is above or below the center of the lens. The framing light for the vertical FOV is to either side of the lens center. The patent covers a number of versions for any format camera from a professional still or video camera, or compact digital camera to cell-phone camera. The Framing Light projects frame lines into the scene that match the camera’s field of view. Rather than the DP and set builders loosing time checking the composition in the camera monitor, they can work in the subject space seeing exactly what will be covered by the camera lens, removing light stands and adjusting props. The Framing Light really shines when shooting a complex set, shooting through doors, into mirrors, and underwater, etc. The Camera Framing Light provides a visual reference of the FOV regardless of the complexity of the scene or the camera angle. Version 4: As adapters for still and motion-picture cameras. The Framing Light projects a camera’s field of view into the scene to eliminate the need to return to the camera viewfinder, or monitor to check composition, and is now available through camera-rental companies in the Hollywood area. The Framing Light can be used in advance of the shoot without the camera being involved, saving camera rental charges before shooting. Two identical Framing Lights are supplied in the rental package, and are attached to a cage frame above and beside the lens (optimized for the Arri Cage System 1). The lights are the brightest that are allowed without requiring eye protection. The adjustable spread angle covers 99% of all camera lenses. In spite of the Framing Lights being displaced from the camera lens, there is zero (0) parallax error between the Framing Light and the camera lens. The adapter plates each provide a slot and a row of attachment holes for X and Y position. When the top Framing Light is mounted directly above the nodal point of the camera lens, the projected vertical lines align exactly with the width of the lens FOV (viewed from above): providing zero parallax in the horizontal FOV. Correspondingly, when the side Framing Light is mounted directly beside the nodal point of the camera lens, the projected horizontal lines align exactly with the vertical FOV of the camera lens (viewed from the side): providing zero parallax in the vertical FOV.